On October 9th, Google will officially unveil the Pixel 3 and Pixel 3 XL. The two smartphones have been leaked extensively ahead of time, and despite rumors to the contrary, there will only be two models and the Pixel 3 XL will definitely have a display notch. The larger of the two fell into the hands of some Ukrainian and Russian bloggers/YouTubers, affording us the opportunity to catch a glimpse at what Google will be bringing to the table. One of these Russian blogs showed off images of a dogfood Google Camera app with a setting called “Google Lens suggestions.” It wasn’t exactly clear what that feature would do, but now we have a better picture. A new leak reveals that the Google Camera app on the Google Pixel 3 and Google Pixel 3 XL will gain support for real-time Google Lens analysis of images. This information comes courtesy of a video posted by Twitter leaker @IshanAgarwal24. He tweeted out screenshots of various features in the new Pixel 3 smartphones, although almost everything that he published was already known. The two devices will support Now Playing, Active Edge, Google Assistant, App Actions in the Pixel Launcher, Smart Replies in Android Messages, Smart Text Selection from Android Oreo, AR Stickers, Android Pie‘s markup app for screenshot editing, Picture-in-picture mode, Direct Share, Ambient Display with Always On Display support, Fingerprint swipe gestures, Navigation gestures, and the two existing camera gestures. We don’t expect the new Pixel 3 smartphones to have a lot of new features over the existing Pixel 2, so it’s no surprise that the demo video of the “Pixel Tips” app that was posted doesn’t show us a lot of new information. But in a few seconds of the video he published then removed from YouTube, we can see a business card put in front of the Pixel 3’s camera viewfinder. After a second, Google Lens recognizes the email address shown on the card and shows a popup that can be selected to open Gmail to send an email. 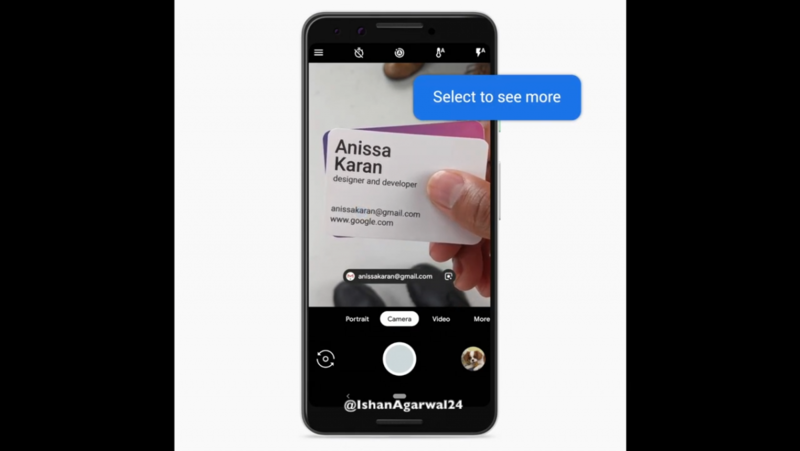 Google Lens can already work in real-time once you launch it, though it doesn’t operate automatically when you’re in the Google Camera app on the Google Pixel or Google Pixel 2. We can independently confirm the existence of a Pixel Tips app used for showing off features to new Google Pixel owners. We found references to the Pixel Tips app in the Google App, thanks to a teardown we performed using JEB Decompiler by PNF Software. While we don’t have any of the system APKs to share, we do know that Pixel Tips is real. If we learn more about either the Google Pixel 3 or Google Pixel 3 XL, we’ll let you all know. By the way, the XDA forums for both devices are open, so if you’re eager to talk about these latest devices, then you should definitely check them out via the XDA Labs app.